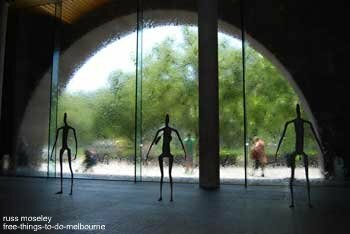 There are two parts to the National Gallery of Victoria (NGV), the NGV International containing all the international art and the Ian Potter Centre: NGV Australia which has all the Australian art. 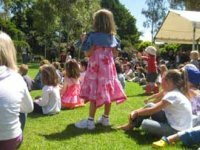 You'll find the NGV International at 180 St Kilda Road, a little walk up St Kilda Road from Flinders Street railway station, just past the Arts Centre spire. 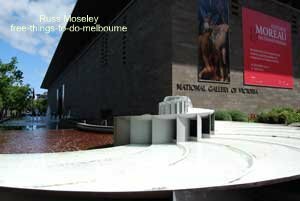 The Ian Potter Centre : NGV Australia is in Federation Square. The NGV is Australia's oldest public art gallery. It was founded in 1861 during the gold rush days although the present International building was only constructed in 1968 and the Ian Potter Centre was built in 2002. The NGV contains what is regarded as one of the world's finest art collections with over 1 million people visiting every year. I won't bore you with too many details as you can find these in National Gallery of Victoria but in a nutshell, the International section holds comprehensive exhibits of European paintings from the 14th Century onwards, Decorative Arts and Antiques from 17th Century, Fashion and Textiles from 18th century, Photography from 1840's, Asian Art and some pre-Columbian art. The Australian section of the NGV has paintings from colonial times onwards, fashion, textiles, photography, prints, drawings and indigenous art. Both Galleries also have fairly regular free permanent collections and many of the special exhibitions are also free. ......should keep you occupied for a while! 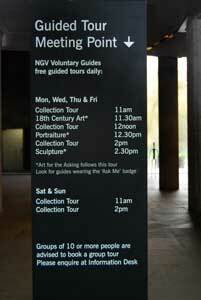 You can also get free guided tours in these Galleries. Take a look at Guided Tours for more information. Both museums are now open daily between 10am and 5pm except Christmas Day. Check out the map below which shows the location of the two galleries.